Showing love to your feline friend does not end with playing and feeding. You can invest a cat house for them! A high-quality cat condo can provide comfort to your cat. Most of the models feature a scratching post so that you can save your furniture from their scratching needs. 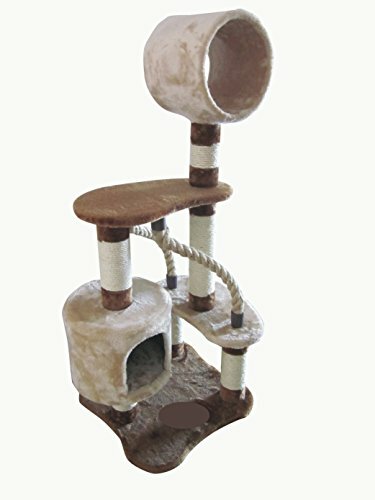 It also provides a climbing post and perches to encourage your cat in exercising and being active. Cat condos are often available in your local pet stores. However, if you are planning to buy online, allow us to be your guide. Here are the top 10 best cat house we’ve gathered for you that your cat will surely love! Spoil your cat with this modernly styled cat tower by The Refined Feline. It offers four levels for your cat to lounge and climbs all day long. Brown Berber carpet is attached to every platform with Velcro for easy climbing. This cat tower can fulfill your cat’s scratching needs with its sisal pad. Hide-a-way cubby on the first platform is covered with soft cushions and washable faux suede. It’s easy to assemble. In just a few minutes, you can erect it on your living room or patio and entice your cat inside. The package includes all the tools you will need. Also, parts prone to wearing are replaceable. The cat tower is made of ply with oak veneer so it can last for a long time with proper use and maintenance. This ready-to-use cat condo is the perfect gift for your cat. You need not assemble the product upon arrival. The solid wood, plush household grade carpet, and sonic tubes used for construction ensure durability for a long time. It also features an unoiled sisal rope for your cat to scratch on. This model is available in colors beige, brown, blue, green, and gray to match your interior design. Every platform of this cat condo has a household carpet inside. 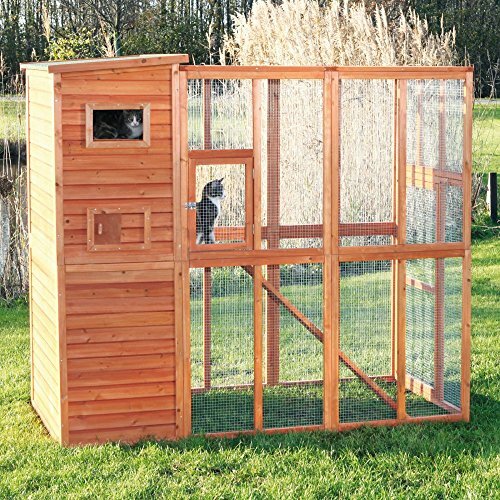 Its solid construction is perfect for pet owners who have large-sized cats. This model can accommodate several cats all at once without getting knocked over. The thick and heavy wood used provides stability while your cats are lounging on its perches. Protect your kitty from the harsh elements of nature with this waterproof cat house. It offers a front door and a back door for easy access. You can also install the vinyl flaps for added protection of your cat. This model is made of cedar. This sturdy wood helps to withstand the weather. It’s perfect to use outside the house if your cat isn’t allowed inside. 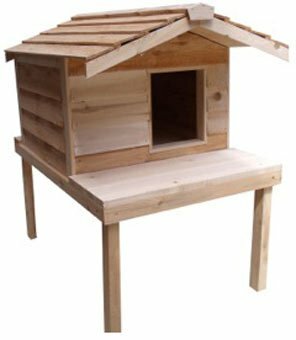 It has a small wooden table so that the cat house doesn’t have direct contact with the ground. When it’s raining, this handy feature can keep your cat from getting wet inside. Pre-drilled holes and labeled parts make it easier for you to assemble the cat house upon arrival. 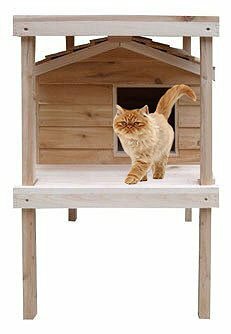 If you have several cats, you might want to check this cat house from Trixie Pet Products. It is made of weather-treated and non-toxic firewood with metal and composite asphalt shingles. The natural fir wood finish allows you to paint it according to your preference. There is an enclosed space with a retreat on an upper level for your cat to sleep in during the night. This model protects your house cats even if you place them outside. It has a large playing area covered with a screen. The large main door allows you to access and keep the area clean. For people who keep on adopting stray cats, this is the perfect cat house for you! Molly and Friends present another stylish yet functional cat tower. There are six large bed and resting areas. Due to its large size, large-sized cats can also enjoy this cat tower. In cleaning the product, you can use a vacuum or wipe it with a clean damp cloth. Avoid soaking it with water or pressure washing as it can cause irreparable damage. The frame material and solid wood poles ensure stability while your cats are using it. You need not assemble the product. It’s ready-to-use straight from the box. 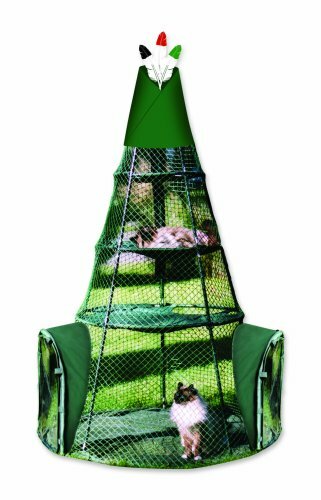 This look-out tower for your kitty can encourage him to exercise more and play in the safety of your own house. If you are planning to place your cat outside the house, check out this waterproof cat house. You can install the back door for easy access to your cat. The package also includes a vinyl flap to provide extra protection when it’s raining. This model is made of cedar wood. It’s an ideal choice if you are planning to use it outside the house. The Thermal-Ply insulation is placed inside the floor, walls, and ceilings of the cat house. In that way, you can keep your cat insulated during harsh weather. Its off-the-ground design is to ensure that your cat doesn’t get wet in case it rains. The porch roof helps in shielding the doorway opening. It also features an upper deck that will allow your cat to sunbathe now and then. With proper care and maintenance, this cat house is bound to last for a long time. Surprise your cat with this four tier cat tree from IRIS USA, Incorporation. There are two hide-aways for a sleeping area during the night. Multiple perches also allow your cat for lounging all day long. It also features two climbing ropes to encourage your cat’s acrobats even inside the house. The compact design of this model is excellent for pet owners who have limited space inside their living room or patio. Its sturdy wood components will last for a long time with proper care and maintenance. This is easy to assemble. In just a few minutes, you can erect it on the ground and let your cat play. Should you wish to place your cats outside the house, you might want to check this item. The unique design of this cat teepee caters to several cats and assures their safety even if you place it outside the house. It also provides a safe and secure spot to sleep during the night. The model is made of solid steel, nylon rip-stop netting, and weather-resistant canvas. With proper care and maintenance, it can last for a long time. There are three levels for your cats to play inside. Includes mesh to protect your cats from mosquitoes and insects that might infect them. You may or may not install the mesh according to your preference. This cat teepee is portable and includes a travel bag. If you plan to bring your cats on a road trip, this could serve as their camping tent! This designer cat condo is perfect for pet owners who want to spoil their cats. Two hide-a-way cube areas provide sleeping space for your cats during the night. One playing rope a wooden ladder, and two perches to encourage your cat in playing and exploring. Plush levels are included for a real look-out tower that your kitty will surely love. The package consists of teasing toys and multi-scratching posts for your cat’s scratching needs. Now your cat can lounge all day on the top post. 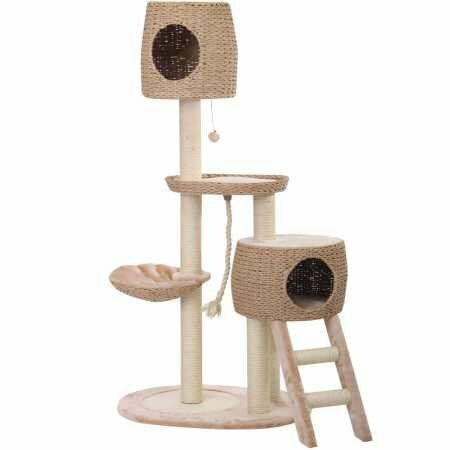 The double scratching posts and other items will keep your cat entertained. 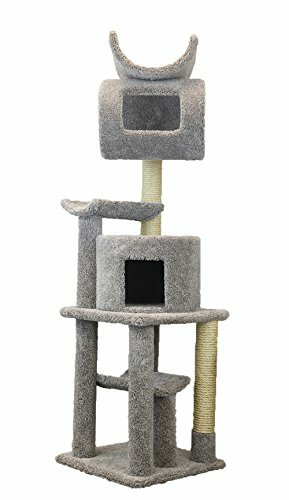 This cat castle is perfect for active cats that keep on playing inside your house and scratching your furniture. Let them rule their kingdom with this cat castle! 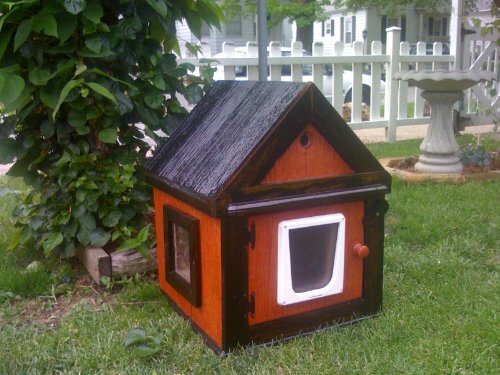 This cute wooden and headed outdoor cat house is just what you need! Now you can keep your kitty warm and cozy this coming winter. It features a thermostat controlled heat to keep your cat insulated inside. It features a trixie cat door for easy access. One square window allows you to peer your cat from the inside. The attic of the cat house is insulated as well. Its dark walnut color perfectly goes with any garden. Just place it outside the home, put catnips inside, and your cat will never leave this house!